With the Peggy Kirk Bell Girls’ Golf Tour beginning our 9th season, one of the most rewarding parts for me is to see how the opportunities we provide have impacted our members. A prime example is Katherine Perry. Katherine was the first “stand-out” player on the PKBGT, winning the Order of Merit in 2008 and 2009 as the tour’s top performer. At the time, the tour was predominately players in the Carolina’s and Katherine stood out among her peers. A consistent player with a quiet determination in her game, she placed in the top-2 of a record seven consecutive PKBGT Championships, including victories at the 2008 Open Championship & 2009 PKBGT Invitational. After a successful collegiate career, she now turns her attention to playing on the LPGA Tour. She travels to Florida next week for the Final Stage of LPGA Qualifying to compete for status on the LPGA and/or Symetra Tour. I interviewed her recently to learn more about her journey in the game and to share her experiences with the next generation. TGG: What was is your fondest memory on the PKBGT? Katherine Perry: The memory that sticks out the most from my time on the PKBGT was the pool party with all the golf girls at the Salisbury tournament. I remember all of us laughing, being silly, and having a genuinely good time with each other away from golf. The very best part about junior golf in general was the lifelong friendships and connections that were made. The countless post-round dinners with the girls and their parents lead to some pretty hilarious memories that I’ll never forget. TGG: Tell us about your college recruitment process. Any advice you would give a PKBGT player? One of the things I think coaches struggle with is the inability to talk with players or their parents before a certain date. Coaches may come out to recruit at a tournament and most likely they won’t be able to say more than a “hello” to you or your parents. It’s important to know that they aren’t being rude, but simply following the rules. In my recruitment process, September 1st of my junior year of high school I received letters from several different college coaches stating their interest in my golf game. I got in touch with these coaches (and others) through email and sent out a golf resume/schedule. I scheduled unofficial visits with the coaches to see the school and learn more about each golf program. Occasionally coaches would come out to tournaments to learn more about how I operated on the golf course. It wasn’t until I got to UNC that I realized that the coaches weren’t looking for me to hit 72 perfect shots, but rather they were watching to see how I would react to adversity on the course. It is so important to coaches how girls act after a bad shot/hole and how they treat their competitors and parents. For me personally, during the entire recruiting process my heart was set on UNC. I had always dreamed of playing at UNC but by the end of my senior year I hadn’t received any offer from UNC. It wasn’t until I qualified for the US Open that I was presented with that amazing offer. You never know what’s going to happen out there…Just keep working hard and playing your best and you will find a place for you to play college golf. TGG: What did you find the most difficult part of adjusting to playing college golf? Katherine Perry: TIME MANAGEMENT! It’s hard to adjust that first semester of college to the rigorous schedule of college and golf. A typical day would begin with workouts, then on to breakfast, class, lunch, practice, dinner, study hall, and bed. Once you’re able to manage your time and stay on top of school work, things get a lot easier. Another difficult adjustment came on the golf course. I went from being #1 in the state to struggling to make the top five on my team to be able to travel to the first tournament. It took about a semester to understand that all of the girls playing college golf were really good, and that we were all on similar levels. That first semester I struggled to keep my confidence up and remember that I was a good player. I guess it was an adjustment to go from being a big fish in a little pond to being a little fish in a big pond full of incredible golfers. TGG: Tell us about your collegiate career. What was the driving force behind your turning pro? Katherine Perry: I had such a great time during my four years at UNC. I met lifelong friends and made memories that I will forever be grateful for. From a golfing standpoint I always felt like I should have/could have performed better. With that being said, I did have quite a few top ten finishes and we had several team victories in the four years I was there! Those team wins were so much sweeter than any individual high finish because of the combined effort they required. The best win was our ACC Championship win in 2011. We all played so well and so smart that we took first place by 24 shots. Hoisting that trophy in the air with all of my teammates and coaches was such a rewarding and exciting feeling. TGG: Tell us about LPGA Qualifying School. What is your favorite part about the process so far? Katherine Perry: LPGA Q School has been such a fun adventure so far. I heard horror stories coming into q-school and wasn’t really sure what to expect. I went to stage 1 (Rancho Mirage, CA) with the mindset of “whatever happens, happens.” I knew that I would figure out a way to play next year no matter how I finished. I really think that mindset and having my dad as my caddie helped me stay calm and relaxed throughout the first stage. I finished in the top 5 at first stage by shooting under par over the four day tournament. That experience, and knowing I could compete with these girls, gave me confidence heading into stage 2 (Venice, FL). My parents, boyfriend, and I drove 12 hours down to Venice from Raleigh for the second stage. We stayed in a cozy cottage and had such a great time outside of golf. My parents were so good at keeping me relaxed pre and post-round and were such great supporters the whole time. I was able to shoot under-par for the tournament and left Venice with confidence that I could finish well at the final stage. The best advice I’ve received so far about final stage is that the only pressure I will be feeling is the pressure I put on myself. If I stick to the things I can control (mindset/practice) and let go of the uncontrollable factors then I will have a great time out there with zero pressure. TGG: Tell us about your preparation for a tournament. How would you recommend someone prepare? 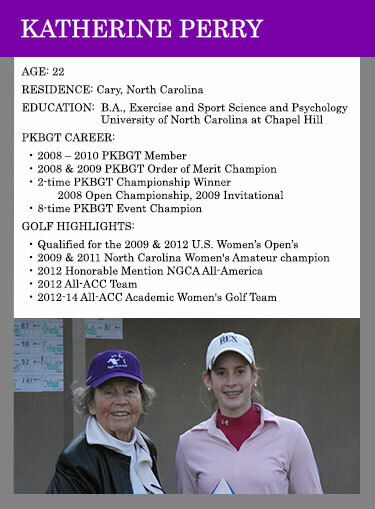 Katherine Perry: Most of my practice consists of short game (putting, chipping, wedges, bunker). I personally dislike beating balls on the driving range unless I am working on a specific swing change or Robert is there to give feedback on the shots. I probably spend about 60% of my time putting. This includes speed drills, a ton of putts from approximately 30 feet (the average distance from the hole on tour), and drills to build confidence on 3 and 4 footers. Chipping/pitching takes up the next biggest percentage of practice time at about 30%. For me this includes chipping drills, up and down drills, bunkers, and wedge shots into the green and funky lies around the green. The last 10% is used for range time. I do strongly believe that getting out onto the golf course to play is much more beneficial than practicing for 2+ hours. You can practice all day, every day, but in the end you have to be able to translate what you’ve practiced to the course. Only on the course will you be able to figure out how to get out of trouble, build confidence in making birdies/pars, and learn how to pull yourself together mentally. TGG: Tell us about your in-round routine. What do you eat & drink during tournament rounds? How do you stay focused? Katherine Perry: I’m a little embarrassed to say that I don’t eat as often as I should during a tournament round. I try to eat after nine holes and sometime around Hole 15. I think it would be much more beneficial to my game if I ate a little snack every 3 holes or so. I usually eat peanut butter crackers, grapes, carrots, nut mixes, cheese, and protein bars during my round. I don’t think it’s necessary to stay focused 100% of the time you’re on the golf course. If we did that, we would be exhausted after just a few holes. However, I do believe it’s extremely important to stay focused during your pre-shot routine, your shot, and your post-shot routine. I usually walk down the fairways thinking about what I’m going to have for dinner, or looking at a funny shaped cloud, or observing nature. When I get to my ball, it’s a different story. I flip a switch and go through the necessary steps to hit the best shot I could possible hit. This includes getting the yardage, understanding the location of the pin on the green, my margin for error on the shot, the wind, the lie, etc. Once I have hit the shot, I try to turn the switch back off and start thinking about the clouds again. Each person is different with their “in-round routine”, but I think the most beneficial routine for me includes some time where I can zone out and think about anything but golf.